Gold: Good News…But Where's The Demand? What should the gold/silver ratio be? There are lies damned lies and Central Bank Gold statistics. Total official global gold holdings are reported to be 33,000 tonnes. That is 19% of all the gold ever produced in the world. But how can anyone ever believe any of these figures. Because no central bank ever has a public audit of all its gold holdings. Since the gold belongs to the people, they have the right to know if the gold actually exists, especially since the gold reserves are backing the currency. Why is the US gold not audited? But no, the truth about these gold reserves are veiled in total secrecy. And why we may ask. Why are the people as well as the creditors of a country not told the true financial position? What do these central banks have to hide? Let’s take the US. 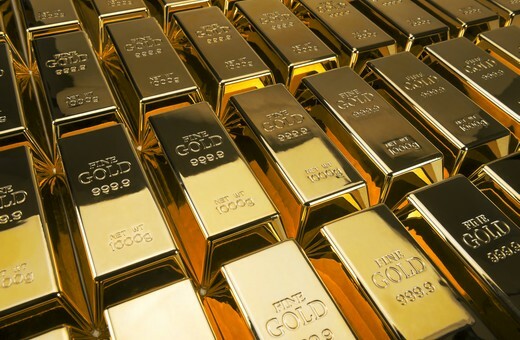 The US is allegedly holding 8,100 tonnes of gold, stored in Fort Knox, Denver and New York. The last official audit was 64 years ago in 1953 when Eisenhower was president. Since then, the US Government claims that the US gold has been audited over a period from 1974 to 2008. But no proper figures have ever been published. FORT KNOX – WHERE IS THE GOLD? The first question to ask is of course how an audit can ever take 34 years!!!! Only a government organisation can take 1/3 of a century to audit their assets. I know of no company in the world that can take 34 years to report their assets to the shareholders. The stakeholders of the US gold are the US people and they certainly have the right to know if the country really holds $332 billion worth of gold. 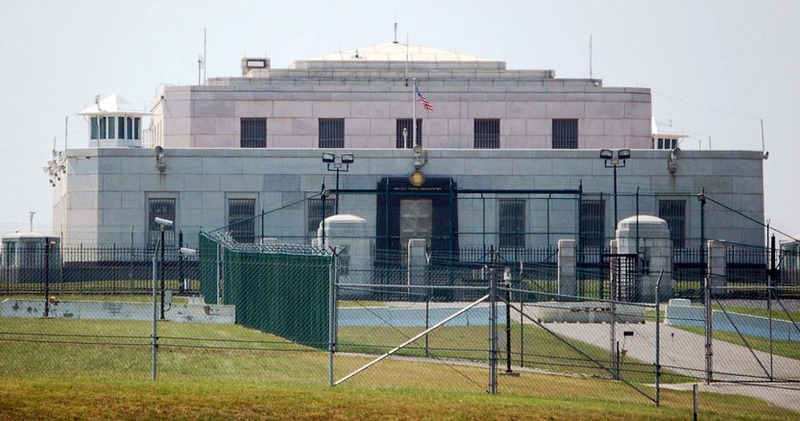 Steve Mnuchin, the US Treasury Secretary, spent an afternoon in Fort Knox last week. After having seen a few percent of the total gold held there, he confirmed that it was SAFE! Well that’s good to know but he obviously hasn’t got a clue how much is there. Secondly, an audit carried out over 34 years cannot possibly be accurate. The movement in gold over that period would totally nullify the accuracy of the audit. Thirdly an audit should be carried out by independent auditors. This audit was done by a Government Committee for Gold and the Treasury. The exact method of the audit has not been revealed but according to some sources, the methods were highly suspect. Fourthly and just as relevant is the total balance sheet position of the US gold holdings. The physical gold is only one part. Central banks practice gold lending or leasing on a major scale. Thus, the US could lease its gold to another bank against a fee. Lending can take place without the physical position of the gold changing. Other banks accept to borrow gold from the Fed without having it in their possession. There can also be swaps, forward sales and other derivative transactions that reduce the holding. Germany used to store 70% of its gold abroad with the majority in the US. In 2013, they were under public pressure to repatriate the gold and declared that 674 tonnes would be repatriated from the US and France. They only received 5 tonnes in the first year because there was no gold available. It had probably been lent on to someone else. Finally, they just stated that the 674 tonnes are now in Germany. This means that around 50% of the German gold or 1,665 tonnes is still held abroad. The obvious question is of course why not hold it all in Germany. The official reason is risk spread and trading. It is dubious if the US or the UK are safer places than Germany. Financially Germany is clearly safer. All central banks trade part of their gold. To lease gold to someone, it doesn’t have to be held in New York or London. The leasing could easily be done from Germany. Possibly, the 1,665 tonnes held abroad have been covertly sold or leased to a bullion bank which has sold it on to China. And China of course always takes delivery. They wouldn’t be so stupid to keep a major part of their gold in the US or London. If the German gold has been leased and shipped to China, all the German government has is an IOU from a bullion bank. So instead of physical gold they have a piece of paper. The same could easily be the case with the US gold or other central bank gold. 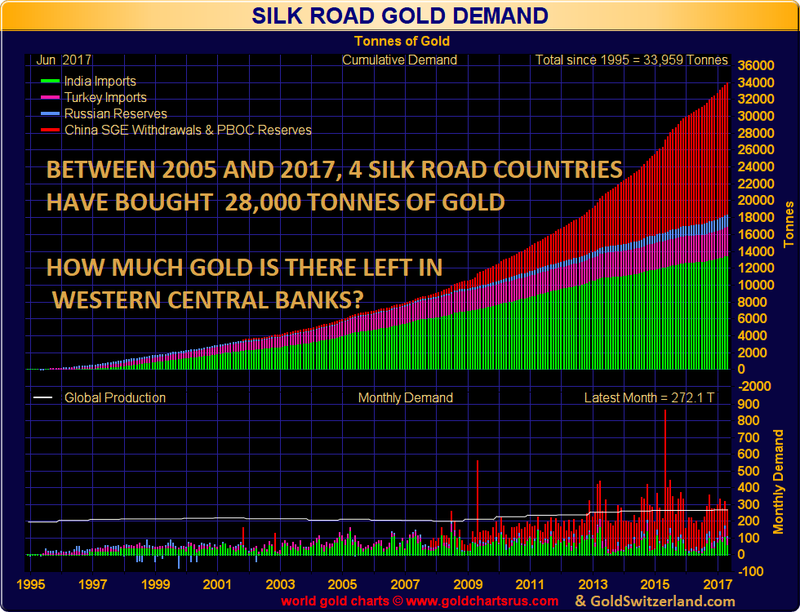 With the massive buying we have seen from Silk Road countries in the last 10 years, it would not be surprising that a major part of the gold has come from Western Central banks. Since 2005, four Silk Road countries have bought 28,000 tonnes of gold. Many market observers estimate that official gold holdings could be as little as half of the reported figures. In my view, that is not unrealistic. As the chart above shows, there has been a major shift of gold from West to East. Four Silk Road countries have absorbed more than the annual gold production for the last 10 years. An important part of the sales to the East will most certainly come from Western Central bank holdings. Switzerland publishes the monthly imports and exports of gold. These give a good indication of global gold trading since Switzerland refines up to 70% of the gold bars in the world. The chart below shows the Swiss gold imports from July. Of 152 tonnes imported, 80 tonnes came from the UK. The UK is certainly not known as a gold producer. 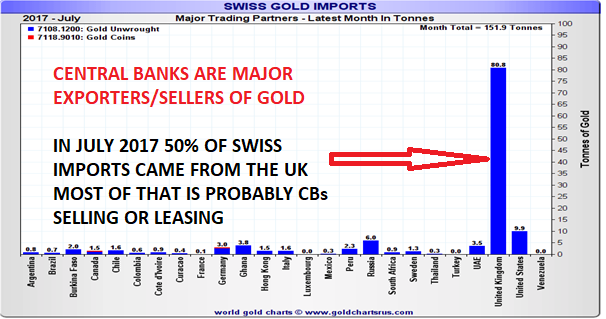 The gold that the Swiss refiners get from the UK are 400 ounce (12kg) bars, most probably sold by central banks. The bars are broken down to 1 kilo bars and then shipped to China and India. These bars could either have been sold covertly by central banks or leased by them to the LMBA banks in London. In the past, the bars leased by central banks would have stayed in London. Since the Silk Road countries started to accumulate gold, the gold held by the LBMA banks in London has declined significantly. The Silk Road buyers are not content to keep their gold in London. They don’t trust the LBMA system where the same gold is lent many times over. Thus, they take delivery which shifts the gold power centre from West to East. Eastern countries and especially China understand that gold is the only currency that will survive the coming collapse of paper money. That is why they are accumulating substantial quantities of gold. China knows the Golden Rule: He who has the (physical) Gold makes the rules. I added the word “PHYSICAL” before gold since physical possession is the only thing that counts. In the West, the vast majority of gold is paper gold which is leveraged several hundred times in relation to the physical. But even physical gold held by banks is sold many times over. We have experienced many times how clients who hold gold in major banks, realise that the gold isn’t there when they want us to transfer it to private vaults. The day that gold investors holding paper gold or unallocated gold, ETF gold etc, realise that there is no gold to back their claims, the whole market will panic. At that point, the market will also understand that a lot of central bank gold has gone from West to East without anyone noticing. The dollar bottomed in 2011 at the same time as gold and silver peaked. In dollar index terms, the dollar rallied 40% until December 2016. That marked the end of the 5 ½ year dollar correction. 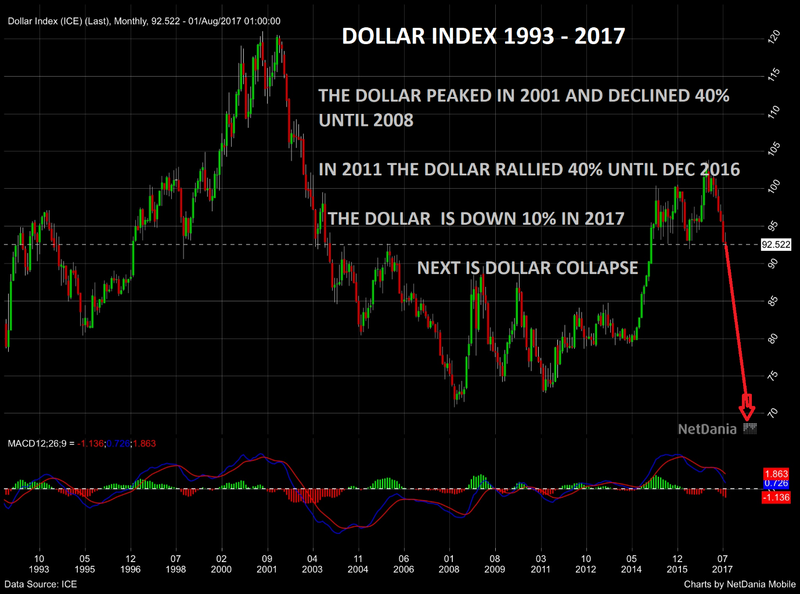 In 2017 the dollar index has lost 10% so far but that is just the beginning. The major decline of the dollar has now started and will finish when the dollar has reached its intrinsic value of ZERO. Gold peaked temporarily in 2011 at the same time as the dollar bottomed. Since 2013 gold has traded in a tight range. At $1,300, gold is 31% below the 2011 peak. But it is only when measured in dollars that gold looks weak. In pounds, Australian or Canadian dollars gold is only 10% from the top (monthly close). In 2017 gold has outperformed the US stock market and rallied 12%. It is likely that we will see a major gold rally in the autumn on the way to a new high. So after a very long consolidation period, lasting six years, gold and silver will now resume the uptrend that started in 2000. The coming rise of gold and silver in the next few years will not just be the reflection of the fall of all paper currencies. Major contributors to the rise will also be the failure of the paper market in the metals and the realisation that central banks possess much less physical gold than they have indicated. Therefore, physical gold and silver will continue to be the best way to preserve wealth during the coming destruction of all bubble assets such as stocks, bonds and property. But the opportunity to purchase gold and silver at reasonable prices is soon ending. There just won’t be enough gold to satisfy the coming demand. Egon von Greyerz is the managing director of Matterhorn Asset Management AG based in Zurich Switzerland. He specialises in wealth preservation with the special emphasis on physical gold stored in Zurich outside the banking system. The sheeple are voluntarily racing into the chute of cryptos. $170 billion in market cap. 10% of that towards silver would have turned the market upside down. Instead we have the lowest mint silver sales in recent history. TPTB couldn't be more pleased. When the likes of the NSA and the master of eugenics, Bill Gates, support cryptos that should be all you need to know. Cryptos are the new vehicle to a cashless society. I'd rather have a tulip.